Welcome to Spectral Tech. We are a small group of investigators striving for a better understanding of true paranormal activity by implementing a variety of investigative tools and techniques; from the scientific to the experimental and from the skeptic to the spiritual. We exhaust all possible natural causes for paranormal claims first before coming to any supernatural conclusions. Our researchers attempt to recreate and objectively document any experiences of possible paranormal activity. We have investigated a wide range of sites, from commercial business clients to private residences. We do not charge anything for our services and try to provide answers and alternatives for our clients. In the upper right-hand corner you will find tabs that will take you to our Evidence Page, where we had posted some of the notable pictures and EVP's we have captured. Our Gallery page posts some of the pictures we have taken, and the Published Articles page contains copies of articles published about our investigations. Mickey Materna has been with the team from the beginning. Mickey was a Fire chief for the Quito Fire Department for six years and was previously a Tipton County TN Constable. Mickey currently works for a fire safety company. ​Mickey brings to the team his knowledge of safety and ensures we are safely conducting an investigation. When Mickey is at an investigation he always looking for anything that could cause the team potential harm. 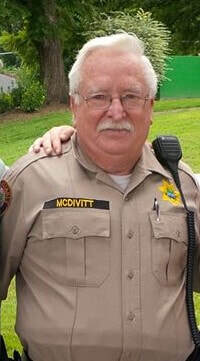 Nick McDivitt Has been a Tipton County TN Constable for over 20 years and is one of the original team members. Besides being a great help when someone calls the authorities about a group of people moving about with flashlights in the middle of the night, Nick approaches EVP sessions like an interrogation and brings his law enforcement logic to every investigation. Scott and Lisa are owners of Covington Liquor in Covington TN. Once being an Army Ranger and previously a law enforcement officer, Scott was initially a skeptic of the paranormal, and his wife Lisa is able to sense things that others cannot see or feel. Originally clients, the evidence we obtained was enough to whet their appetite to learn more. After joining us on several investigations they were welcomed to join our team and contribute their individual skills. Angela Wallace is a new member of the team. Her background as the former owner/operator of The Way We Were antique store, the current Manager of Upscale Antiques, and former Business Development Director for the City of Covington Chamber of Commerce, brings her skills of business experience to the team. Angela makes a great liaison with our team and our clients. Angela is also a thorough investigator and helps in the setup and coordination needed for our investigations. Tara Finley, daughter of Angela Wallace, is a senior at the University of Tennessee at Martin; majoring in Agricultural Communications. Tara works for the City of Bartlett as a camp consular when not attending school, and has interned as a writer at The Covington Leader, which is a local newspaper. Tara has been active in several investigations and has shown a definite talent as a paranormal investigator. Tara also likes the task of data review and analysis, which makes her a more than welcome new member to the team. Brandon Bobbitt , or "B", is one of the newest members of our team. B , along with his close friend Tara, attended a basic paranormal investigators class we had and participated in a mini investigation we had following the class. B, like Tara , has an innate talent as an investigator and has proved to be a valuable and eager member on several investigations since. Brandon is a certified Personal Health Trainer. Chris Richardson Joined our team in October 2017 and is a Tennessee Highway Patrol Officer. A capable investigator that insures we get to our investigations sites safely.. Only because we don't want him to give us a ticket. Bob is an original team member. After over thirty years as a special projects manager working primarily as a process engineer, data collection and analysis is second nature and is primarily what is brought to the team. Besides having a Bachelors degree in Organizational Management from Tusculum College he also has a Bachelors Degree in Metaphysical Sciences from the University of Metaphysics. Bob is also an ordained metaphysical minister/metaphysical practitioner with the International Metaphysical Ministry and is also a Usui Reiki Master. The metaphysical training allows Bob to talk to concerned clients and also is the primary author of the articles published about the team.